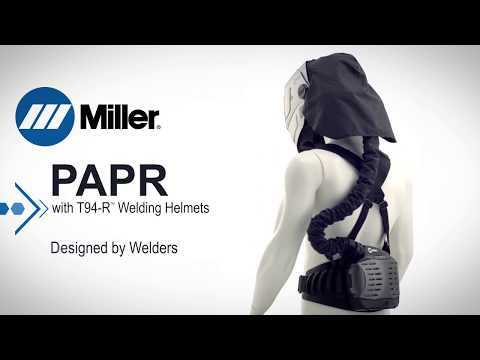 Lightweight, low-profile powered air purifying respiratory systems paired with the T94-R™ series welding helmets. T94 Series welding helmets are designed to perform in the most intense industrial applications while providing unsurpassed comfort. The T94i features 9 sq. in. viewing area with four independent arc sensors and integrated grind shield with 180 degree field of view. Other features include: digital lens controls, four operating modes (weld, grind, cut, X-Mode). Optimizes contrast and clarity in welding and light states. Design enhancements protect AD lens from dust and moisture; Aluminum heat shield reflects heat to keep lens and user cool. Provides improved view in between welds for enhanced awareness and safety. HEPA filter provides filtration of airborne particulate including solid dust particles, metal fumes and mists. Prefilter extends life of the main HEPA filter. Integrated spark guard protects filter assembly from large pieces of debris. Filters provide protection from Hexavalent Chromium (Stainless Steel), Zinc Oxide (Galvanized Steel), Manganese, Aluminum, Nickel, Iron Oxide, Copper, Cadmium, Lead and Beryllium fumes. Lightweight, low-profile blower allows for unrestricted movement and provides all-day comfort, reducing fatigue. Integrated shoulder straps provide a secure fit and equally distribute weight, alleviating lower back strain. Dual air speeds allow users to adjust the volume of air to maximize comfort in varied work conditions. Audible and vibrating alarms notify users in noisy environments. Electronic control automatically adjusts fan speed to keep air flow constant. Quick-release belt for easy, one-handed don/doff. Extends belt length up to 18 inches. For use with PAPR. 99.97% Filtration of Airborne Particles. For use with PAPR. Extends the life of main HEPA filter. For use with PAPR. Extends the life of main HEPA filter, while providing nuisance level relief from Organic Vapors. For use with PAPR. Protects filter assembly from sparks and debris. For use with PAPR systems. Maintaining a safe and comfortable work environment for employees is a high priority for companies. Proper weld fume management is both a moral and legal responsibility, and it can also provide employers with a competitive advantage in attracting and retaining skilled welding operators. The head: the body's command center and the gateway to respiratory health. No other part of the human body affects how we go about doing our job — or how we feel about it — more than the head. For that reason, equipment manufacturers have gone to extra lengths to design products that not only keep welders safe, but also enhance comfort and make it easier to do their jobs. In this article we'll look at personal protective equipment (PPE), specifically head protection, that is making welding safer and more comfortable every day.